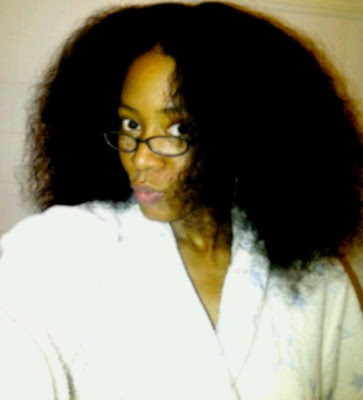 KenyaGurl: Healthy Hair Icon: Naomi! Oh.My.God. Look at her hair! Supreme hair inspiration right here. 2. Favorite food? Too many to mention, but what's definitely on my mind right now are some huge fresh oysters with Tabasco and lemon specifically from Pappadeaux. What does a Londoner know about Pappadeaux you may ask? Whenever I hit Texas it's usually my first stop from the airport to the hotel. I could eat these for days as well as their pan seared frog's legs. Divine! 3. Relaxed or natural? My hair is relaxed (texlaxed), but if you're asking for my particular preference for me it is texlaxed. I've had pretty much every hairstyle including locs I'm not anti-this or that when it comes to hair. I'm pro healthy hair. That's my main focus and goal. 4. How do you keep your hair looking fly? What's your hair care regimen? I keep my hair looking fly by keeping it protected and covered with a half wig. I'm really on a quest to grow it as long as possible. After being on a hair forum for a total of 8 years I had many hits and misses where it came to techniques and being a product junkie. I now have a regimen that's simple yet effective and works for me. I'm texlaxed and only apply relaxer to my new growth every 5 months or so. I go by how my hair feels, rather than a specific time frame as when to relax my new growth. I wash my hair daily with F.A.S.T. shampoo and conditioner whilst they are in 10 twists. I de-tangle each section after washing and proceed to twist them back again. I'll either use a moisturiser like R&B from Lush or Mane n Tail Conditioner as a leave in. I'll simply pin the twists up and that's pretty much it. If I venture out, I'll gel the front of my hair (still in the twists) with 'The Big Tease' gel from Lush, brush back, position the half wig a few inches away from my hairline and put a head band on. You'd be surprised how many people think this is actually my hair. It isn't and I don't have a problem in setting them straight either. I think that's due to the fact that I wear a half wig as a protective method and have a big fabulous amount of hair underneath. 6. What are your fave hair products? R&B hair moisturiser and BIG shampoo from Lush are great products. BIG shampoo is primarily a sea salt shampoo, and has many people thinking it will dry the hair out. With me it did the opposite, made it soft and very big and fluffy. It really does give my hair a lot of volume. I use it occasionally as I use F.A.S.T. by Nisim shampoo and conditioner as my staple, daily hair washing products. 7. What is the hair product, tool, or accessory that you absolutely can not live without? My Tangle Teezer brush is my favourite hair product of mine. I refuse to use anything else to brush and de-tangle my hair. After I used this for the first time, without hesitation I threw 3 of my Denman brushes away in the trash. 8. Favorite hairstyle? I've been protective styling for so long it's hard to even claim a favorite hairstyle. Just big wild & free is great and perfect for me. When I'm at a length that I'm comfortable with I'll experiment with other hairstyles. 9. What's your favorite color? Black...if you can technically call it a colour. 10. The best season for my hair is Spring because it's out of that cold phase but not overly hot that the hair on the back of your neck is making you even hotter. 11. The worst season for my hair is winter because of the elements like central heating being on constantly in the house has a drying effect on just everything. So much more moisture is needed during the winter months. 12. 3 words that describe your hair's personality. Unruly. Wild. Big. 13. The best thing about my hair is that if I want the option to go for the big 'Diana Ross' or slick straight look I can. Got a magnificent head of hair? Let's see it ladies! Shoot me an email at thehairgurl@yahoo.com.